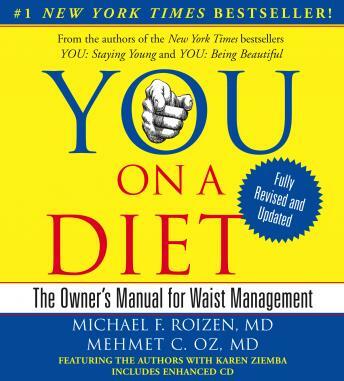 Michael Roizen and Mehmet Oz, America’s most trusted doctor team, are turning their attention back to dieting in this revised edition of their bestselling book on weight loss. When it comes to healthy weight control, management, and bodily happiness, there’s only one place you should be looking: in your body. YOU: On a Diet Revised Edition —through the use of vivid anatomy, visual and verbal humor, strong action plans, and a customized approach to dieting—makes sense of weight loss and weight control. Filled with discussions of the latest diet fads, new tips, and updated tricks, this revised edition of YOU: On a Diet gives you all the tools you need to get fit and healthy—and stay that way. Drs. Roizen and Oz give you the perfect dose of health information and go-for-it motivation to help you understand things like how your body processes food, why being fat isn’t bad all the time, how hormones may play a bigger role than many of us realize, and whether or not the extreme options are worth it. In YOU: On a Diet, Roizen and Oz have redefined what a healthy figure is. Once you understand where you fall on that scale of healthy living, they will give you the tool kit to know what to do and how to do it—as well as arm you with the inspiration you crave so that you can live it.